The chief wishes you a Happy Halloween! We're pretty much having a repeat of last year, hey, if it works, it works. I've got my bread bowls again. I've got gummy worms; the fire chief will love them -- just need to figure out what I'm hiding them in. Yes, yes, yes... I'm working on the retreat pictures. Schnibblers -- we have 2 cute kits for the November challenge -- they'll be on the blog tomorrow. Rouenneries is all listed! I've got a listing that I started at $.01 -- please help me out with that one :-0 free shipping too. He is cute! Have a good time. Cute! If he is happy that is a very good thing. Your fire chief is ADORABLE!! My son was a fireman once, a very long time ago it seems. 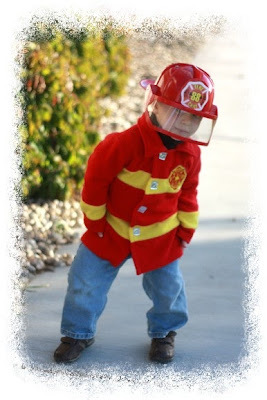 What a cute little fireman! ** Watch for huge giveaways that start tomorrow for several weeks. That is so cute. 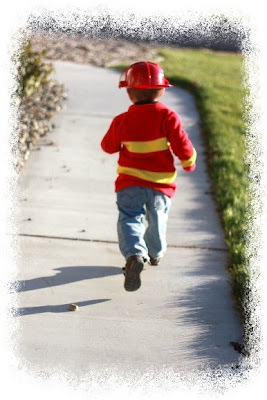 I love the fireman costume.